Within the framework of the Aswan Kom Ombo Archaeological Project (AKAP), which is focused on pre-dynastic sites in the area of Nag Al-Qarmila in Aswan, a new and important discovery has been made. The AKAP Italian-Egyptian mission led by Maria Carmela Gatto from Yale University and Antonio Curci from Bologna University stumbled upon what is believed to be the oldest case of scurvy (vitamin C deficiency) in the world, dated to the era 3,800-3,600 BC. 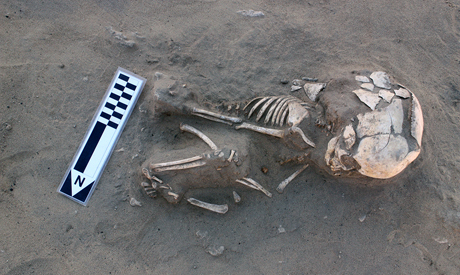 Minister of Antiquities Mamdouh Eldamaty announced today that scientific examination of a recently discovered skeleton of a one-year-old child reveals a change in the shape of the bones, which in turn indicates that the child was suffering scurvy. Mindy Pitre, a physical anthropologist from University of Alberta, said that the main reason for disease is not yet revealed, but that unhealthy food and cultural behaviour could lead to scurvy. Studies are to continue on the child skeleton. Since 2005, AKAP has investigated a number of selected areas in the region between Aswan and Kom Ombo. Many rock art sites within the concession area are under threat due to the impact of modern human activities. Three-dimensional techonologies, such as digital surveying and photogrammetry, were used for the ﬁrst time in the Egyptian Nile Valley in order to document rock art and its environmental setting in a detailed manner. The aim is to improve data recording and analysis while saving resources and reducing ﬁeldwork time.